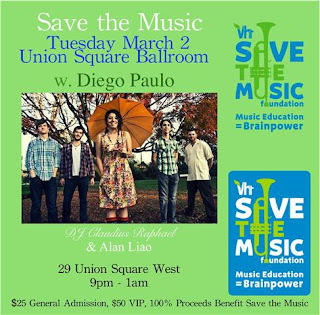 On March 2nd, I attended the VH1 Save the Music Foundation Benefit‏ at Union Square Ballroom. Diego Paulo performed and DJ Claudius Raphael and DJ Alan Liao kept the beats coming. 100% of the Proceeds Benefitted VH1 Save the Music Foundation. Hpnotiq sponsored drinks and snacks were provided by Pop Chips. The Foundation’s core mission is to restore instrumental music education programs, ensuring that every child has access to a complete education that includes the benefits of music instruction. Students with music instruction are more engaged in school and less likely to drop out; and they do significantly better in all of their academic endeavors. VH1 Save The Music Foundation has proudly restored over 1,600 instrumental music programs in more than 100 cities nationwide, putting instruments into the hands of 1.2 million children.